As a nanny, I spend a lot of time reading children's books. In fact, I have realized lately that I read more children's books than I do YA books. And that is actually not a bad thing! A lot of writer's take a pass on children's books because those stories are "too young", the writer doesn't have/isn't around kids, or because the writer believes he or she will find better inspiration in YA or adult books. And while it's true that most children's books have very simple stories because they're meant for young minds, there are also many children's books that have stories that include everything the average reader wants! Interesting characters, amusing dialogue, a good plot, humor, etc. But my favorite children's author to learn from lately? Theodore Geisel. Or as most people know him, Dr. Seuss. 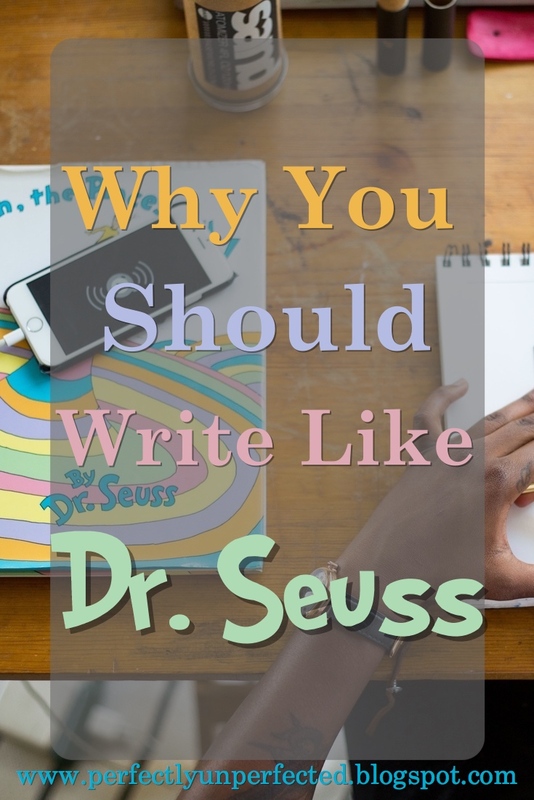 Dr. Seuss stories are much more than simple children's books--they are bundles of whimsical literary masterpieces, and writers could learn so much from them if we paid attention! So to start, I've analyzed a few of my favorite Dr. Seuss books and made notes of writing tips I got from reading them. 1. Dr. Seuss does whatever the heck he wants, and that is amazing. That is literally author goals. This man created worlds, creatures, words! If he needed to rhyme a word but didn't have a word, he made one up to fit. And no one minds, because the average person just accepts that it's a Dr. Seuss book, and he can do what he wants with his stories because he's the author. Is that not the kind of author we all strive to be? 2. Dr. Seuss keeps the reader interested. If you've ever read One Fish, Two Fish, Red Fish, Blue Fish, you probably noticed that once the story gets going, basically every single page is a different concept. And while it wouldn't be so smart to do that in a novel, this is still a good thing to pay attention to. When his story started to become boring, Dr. Seuss would add something new. He would change the direction of the plot. He would invent a new character, create a new word, change things up! But he wouldn't just change things up for no reason--his changes had purpose and direction. Keep that in mind the next time you get stuck or your writing feels blah and boring. 3. Dr. Seuss ties in a bigger message in a lot of his books, including Horton Hears a Who, Hunches in Bunches, and the well-known Oh, the Places You'll Go! Let's use that one for example. It's a children's book, and yet it is extremely popular around graduation time. Why? Because growing up is the big picture message! It isn't just a whimsical story about a character taking a journey, but rather a metaphor for growing up and moving through the world. Dr. Seuss perfectly places a metaphor that adults will pick up on in a story for young readers, and he does that a lot. On the outside, his stories just look like crazy, fanciful rhymes with strange characters and colorful pictures. But in reality, his words hold metaphors for some pretty important stuff. So don't just write a story--give your book a meaning and a message. Use your book and your characters to say the things that matter to you. 4. Dr. Seuss takes risks, which is something that every writer should learn to do. Unfortunately, it's so easy to try to fit ourselves into molds and boxes because that is what society tells people to do. But with writing, you just can't do that. You have to be bold and brave and unafraid to try new things! So what if Starbucks "doesn't belong" in a fantasy story. Maybe it does. Maybe your kingdom has a Starbucks run by fairies. Look at Dr. Seuss. He made up his own alphabet! Literally. I read On Beyond Zebra the other day for the first time and I was completely floored. The entire story is literally of a boy explaining to his friend that while the alphabet ends in Z for most people, it doesn't for him. "My alphabet starts with this letter called Yuzz. It's the letter I use to spell Yuzz-a-ma-tuzz. You'll be sort of surprised, what there is to be found, once you go beyond 'Z' and start poking around!" Be like Dr. Seuss and go beyond Z! Break through the cliches and fads and tropes and take risks. There are so many lessons to be learned from Dr. Seuss books, and I'm sure I will discover many more as I grow my collection of these wonderful books. As Dr. Seuss said, "You have brains in your head. You have feet in your shoes. You can steer yourself in any direction you choose!" Choose wisely, and happy writing! I love kids books/shows that integrate adult lessons. That's one reason I liked VeggieTales so much. It keeps everyone's attention and is usually really funny.